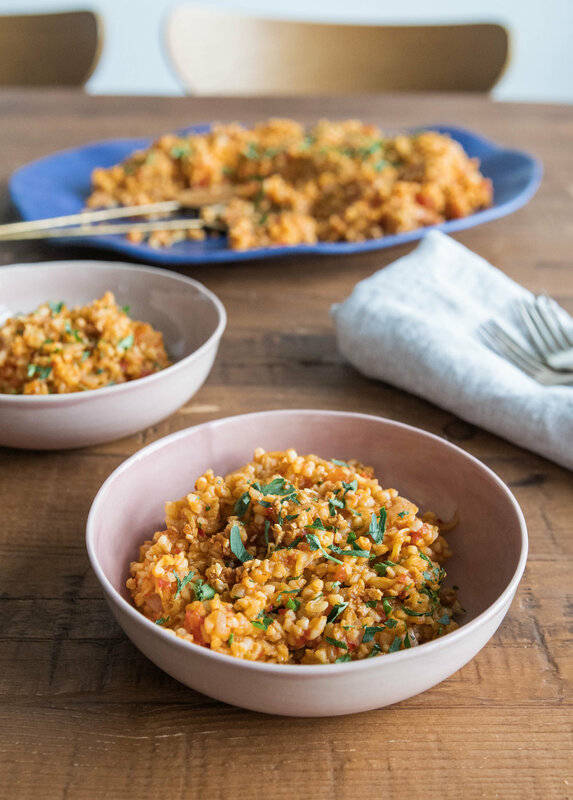 Today I’m sharing Syrian zucchini and tomato bulgur pilaf. 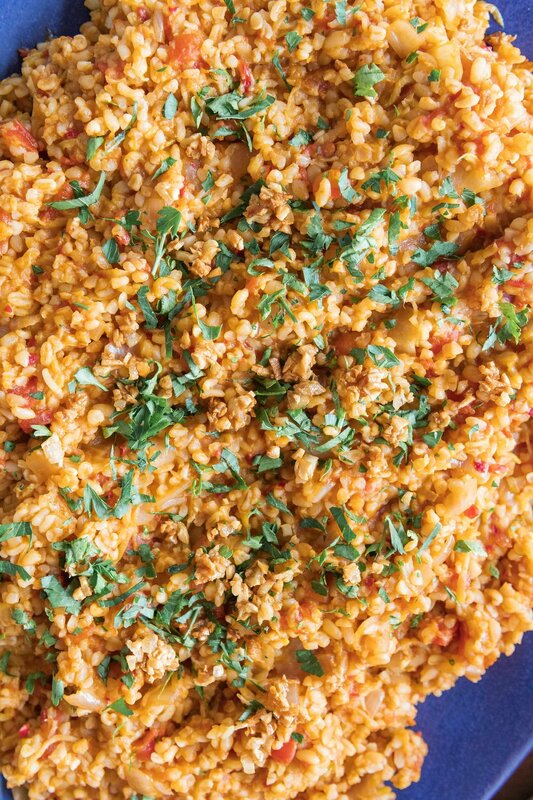 If you haven’t jumped on the bulgur train, it’s time you do. It’s packed with vitamins, minerals and fiber. It’s also fairly high in protein, meaning you’ll stay full longer and keep your energy going. In my opinion, it’s a tastier alternative to rice, and it’s easier to cook. Wins all around! In fact, in Homs, you’re more likely to find bulgur than white rice at the dinner table, with the latter being more prevalent in the other parts of the Middle East. Syrians love stuffed veggies (eggplant, baby marrows, grape leaves, onions, etc. ), and for a lot of these dishes, the insides have to be carved out. So what do they do with those tasty and edible insides? Turn them into other dishes. That’s where this pilaf comes in. This dish is traditionally made with the insides of stuffed baby marrow (similar to zucchini), but you can also use coarsely grated whole vegetables. When they’re combined with caramelized onions, tomatoes and LOTS of garlic (prepared two ways! ), everything melts together, and the bulgur provides a nice bite. It's a super simple dish and so so flavorful. It’s a great quick dinner and perfect for meal-prep lunches throughout the week. I really hope you love it! If you give it a try, don’t forget to put it in the comments and tag #omayahcooks and @omayahatassi on Instagram. Traditionally made with the insides of baby marrows after making stuffed kousa, but whole baby marrows or zucchini is fine. Bulgur wheat is combined with these vegetables, caramelized onions, tomatoes and garlic. Fried garlic is added just before serving. Add olive oil and onions to a medium pot over medium heat. Cook, stirring frequently, until soft and beginning to caramelize, about 15 minutes. Add the smashed garlic and stir to combine for about another minute. Add the grated marrows and cook until moisture is drawn out and completely soft, about 10 minutes. Add the pepper paste, diced tomatoes and tomato paste. Stir to combine. Add the bulgur, salt and 1.5 c of water. Increase heat to bring to a boil, cover and reduce to low until all the water is absorbed and bulgur is cooked through, about 20 minutes. Meanwhile, in a small saucepan, preheat the vegetable oil over medium and add the minced garlic. Cook, stirring constantly, until golden-brown, being careful not to burn, about 4-5 minutes. After the 20 minutes, check the bulgur. If it's cooked and the moisture is absorbed, it's finished. If it's cooked and there's still moisture in the pot, continue cooking uncovered. If it still needs more time, add more water. When cooked, remove from heat and let stand for 10 minutes. Adjust seasoning and stir in fried garlic. Serve immediately or reheat just before serving.